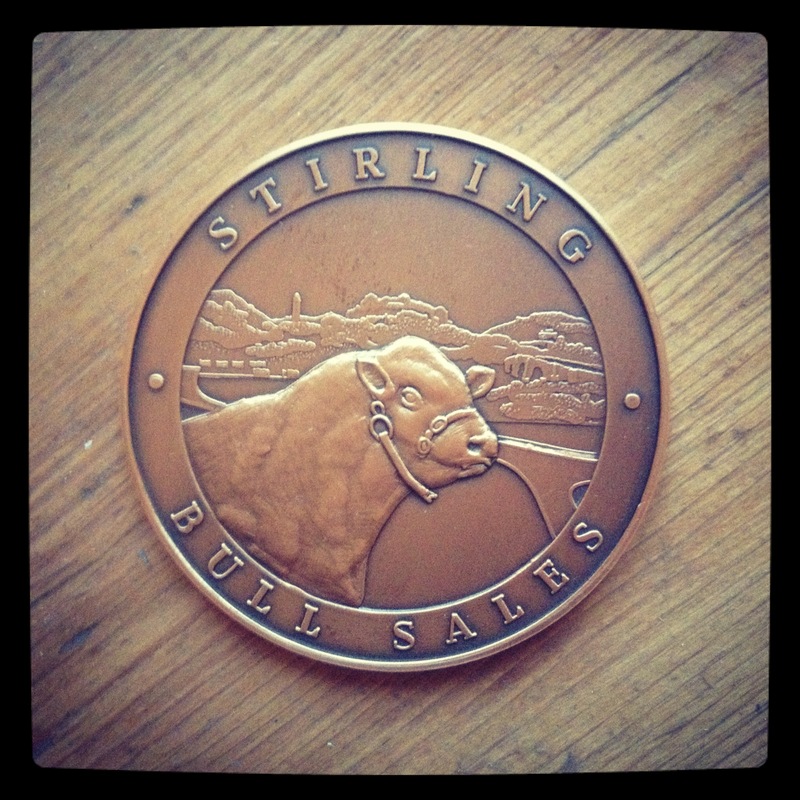 United Auctions (UA) have commissioned one of Scotland’s most exciting artist designers to create an exclusive medal for Judges in honour of the first, official Stirling Bull Sales. Iona Crawford, who is originally from Stirling and works internationally as an artist and fashion designer, was specially commissioned by Scotland’s leading livestock auctioneers to design the medal, which commemorates the Judges’ important role in the national event. The Stirling Bull Sales will take place at UA’s Stirling Agricultural Centre from Monday October 22nd to Wednesday October 24th 2012 with 875 pedigree bulls and females on show and sale. Iona Crawford grew up at Craigend Farm near Stirling, which is still worked by her parents Willie and Evelyn. After graduating with a first class honours from Edinburgh College of Art she has gone on to establish an international reputation as a designer, working within both the fashion and luxury interiors industries. Drawing inspiration from the beauty and diversity of the Scottish countryside, Iona’s painterly practice is stimulated by her artistic impression of her surrounds. In September of this year she spent time in New York, exhibiting during Mercedes Benz Fashion Week, Home Fashion Market Week and the Hamptons Fashion Weekend. After a brief few days back in Glasgow, Iona flew out to Chicago where she was invited to represent Scotland as part of a cultural trade delegation during the Ryder Cup. Moulded in antique gold each of the 60mm diametermedals depicts the head and shoulders of a champion bull – complete with a rosette – against a backdrop of Stirling’s iconic landscape, including the Wallace Monument, Stirling Castle, the Craigforth Crag and Dumyat leading down to the Rivers Teith and Forth, which converge near the Agricultural Centre. The medals will be presented to each of the seven Judges in a handcrafted Bury Elm wood box lined with green tweed. Each Judge’s name will be engraved on the reverse of the medal alongside the month and date of the Sales. Neil McLean, UA’s Group Joint Managing Director who led on the project, said: “The introduction of the Judge’s Medal is an important new feature for the Stirling Bull Sales and, as far as we’re aware, is the first of its kind. It is a mark of respect for the Judges and their considerable knowledge, experience and skill. Iona Crawford said: “Whilst work dictates that I often travel internationally to promote my brand, at heart I am a Stirling farmer’s daughter and enjoy returning regularly to help out at Craigend and to hear what’s new on the farm. The Autumn Sales sees the largest entry of Beef Shorthorn heifers forward to date at the Autumn event – 122 in total will go under the hammer on Monday October 22nd. On the same day, there will be a major reduction of the high-achieving Mosston Muir herd of pedigree Aberdeen Angus from Tom and Joyce Rennie of Forfar, which has won the Walker Shortbread Trophy seven times. President of Herd Book Charolais, will be welcomed from Magny-Cours in Central France to judge the Charolais entries on Tuesday October 23rd. He will be the first Charolais Judge to receive the new Judge’s Medal. In addition, two charity auctions of paintings will take place during the Sales with two paintings of Beef Shorthorn cattle raising funds for the Strathcarron Hospice while the RSABI will be supported by the auction of two further paintings of bulls and a part-set of Aberdeen Angus Herd Books. The agricultural charity will also have a trade stand at the Sales to raise funds for their support services. David Leggat, UA’s Executive Chairman, said: “We’re delighted with the number and quality of entries on show and sale for the Stirling Bull Sales. Medals will be presented to each Judge at a private lunch or dinner following their respective show. Share the post "United Auctions introduces new Judge’s Medal by Iona Crawford at Stirling Bull Sales"